Speeding cameras are not Germany’s favorite piece of technique. Although the German population is a fan of anything which brings order and the populace easily obeys rules imposed, speeding with their high performance vehicles is one of their favorite pastimes (certainly on their no-limit highways known as the ‘Autobahn’). During the Christmas break you can therefore bet on some form of vandalism happening to the ‘Blitzers,’ which is how the inner city speeding cameras are known. 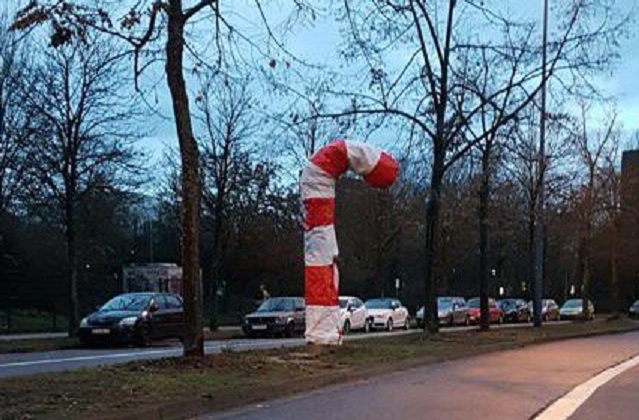 This year, an unknown group in the city of Saarbrücken has managed to render the speeding cameras useless by turning them into giant candy canes during the Christmas period. They did so as part of an action called ‘operation Blitzkrieg’ as was said in the explanatory note written on the plastic wrappings. The activists hit the city’s speeding cameras this Sunday night according to local media. The police admitted yesterday that three cameras in the city center had been turned into life-sized candy canes. On photos on Twitter we could see that they were full of colored balloons inside in order to hold up the red and white striped plastic covers. It is still unclear who is behind the action on the eve of Heiligabend (Christmas Eve). The police removed the red-white packaging fairly quickly. They stated that they were amused by the giant candy canes, but could not tolerate it. "Covering the cameras is a violation of the Road Traffic Act because the devices then cannot do their job," said a police spokeswoman on Radio Saarland. On one of the candy poles that the police confiscated as evidence, someone had written with a black marker 'Operation Blitzkrieg', as well as 'Yes we Candy' and 'Feast of love'. According to local media it is not the first 'Blitzkrieg' in the city. Last year some speeding cameras were decorated with feathers. This is how stupid and complacent we have become. Every single 1 of these cameras worldwide is a slot machine for gov bureaucrats.